The Motorcycle – Graduated Licensing System (Motorcycle-GLS) was introduced Victoria-wide in April 2016. The system was developed following input from industry advisory groups, public opinion (through discussion papers), industry training and testing providers, road safety experts, and the University of NSW and VicRoads. The consultation leading up to the introduction of the Motorcycle – GLS was extensive and far-reaching, taking approximately two years. Why Was The GLS Introduced? The Motorcycle – GLS was developed with the specific aim of improving safety for motorcyclists by providing an industry-wide, uniform training and testing program which would not only ensure that new riders would develop the practical skills required to be safe in real-world traffic situations, but it would also develop cognitive skills and promote safe-riding attitudes amongst novice riders as they progress through the graduated system. 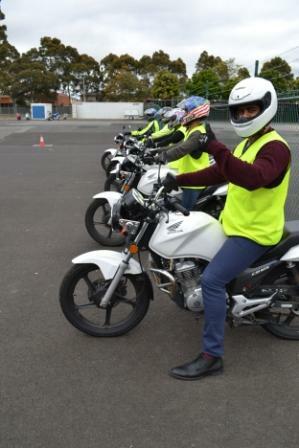 Prior to the introduction of the Motorcycle – GLS, the Victorian accredited training and testing providers each had their own in-house developed training packages which varied in content from zero training (simply a “test-only” facility) to a two day package of pre-learner/learner permit training. The only standard which was controlled and delivered in a uniform manner was the actual assessment and testing which was carried out in strict accordance with VicRroads requirements. So, under the old system, while the testing and assessment was controlled, the actual training content and quality was totally “freelance” and consequently the content and quality could not be assured on an industry-wide basis, and therefore may have affected the preparedness of new riders to meet the safety requirements of real-world riding. The Motorcycle – GLS ensures product quality is controlled and industry standards cannot vary as all the all training and testing providers are now delivering to their customers a prescribed M-GLS curriculum which has been mandated as the industry standard. The timings and delivery methods of the new Motorcycle – GLS are strictly controlled ensuring that all novice and less-experienced riders are receiving sound initial training for their learner permit and progressive training in safe riding and roadcraft techniques as they progress from learner permit to licence stage, no matter which training outlet provides their training and testing. One of the main priorities of the new Motorcycle – GLS is to ensure that new riders are developing defensive riding skills and attitudes throughout the graduated system. This starts with the introduction of “group discussion” sessions within the two day Learner Permit course which encourage and promote safe responses and defensive attitudes to road hazards and other road users. The two day Learner Permit course also provides extensive practical skills training for the novice rider, to the point where the assessments are now carried out “on-road” as well as on the training range, whereas, prior to the M-GLS the practical assessments were purely on-range. Following the attainment of their learner permit, (which is valid for a total period of 15 months) new riders must return to a training provider to undergo the next stage of the graduated system, the Check Ride. The Check Ride can be undertaken at any time after a rider has been issued with a learner permit, however, it is strongly advised that the rider take some time to develop and gain confidence with the skills riding practice which they learned during the Learner Permit course prior to returning for the Check Ride. The Check Ride stage is designed to check and develop the rider’s road safety, awareness, anticipatory and defensive skills in a real-world riding situation. It is 3.5 hours total duration and while it encompasses practical control skills, the main focus is on practical roadcraft skills and safe riding techniques. It ensures that riders are aware of the main hazards which they are likely to face as a motorcyclist, and how to recognise and respond safely to those hazards, which reinforces the importance of defensive riding techniques. Once a rider has successfully completed the Check Ride, they can then move on (a minimum of one calendar month later) to the final step, the Licence Assessment. It is important to note that there must be at least one calendar month between the completion of the Check Ride and the Licence Assessment, as this gives the rider chance to develop the skills and techniques acquired from the Check Ride stage and to rectify any problems which may have been pointed out to them within the feedback from the Check Ride. To get the most out of the Check Ride you shouldn’t leave it to the last moment. At the time of undergoing their Licence Assessment it is also mandatory that the rider has held their learner permit for a minimum period of at least three months and must not have been subject to any driver licence suspensions or cancellations during the three months immediately prior to taking the Licence Assessment. The Licence Assessment, as the title suggests, is purely assessment only and does not include coaching. It is carried out mainly on-road, after a short diagnostic ride on our training range. It is one-on-one with the Assessor and it is assessing rider safety techniques and skills in normal traffic situations. Ride-Tek believes that the Motorcycle – GLS is a valuable and welcome step forward in promoting and fostering safe riding for motorcyclists. It is a genuine attempt to ensure that riders not only are gaining the practical control skills which they will need to stay safe, but also to educate new riders regarding the importance of sound decision making as a rider and the development of defensive riding techniques. If I have any criticism of the new system it would be offered purely as a constructive observation that I feel we may be missing an opportunity to develop and fine-tune rider skills at the Licence Assessment stage by not making a training session mandatory at that stage of their riding where they are starting to understand the dynamics of motorcycle handling and are at a good stage to be able to “upgrade” their practical and cognitive skills to the next level. As a training provider, Ride-Tek MTA also provide riders with a Discretionary Training Options of further training by way of One-On-One Roadcraft Training with helmet intercom which is rapidly gaining popularity with riders as they develop a more safety-conscious attitude. For new and novice riders you should see the Motorcycle – GLS is an opportunity to learn to be safe and defensive riders and you should use the opportunities offered by the training, after all you are paying to be trained so grab the chance to learn. Refer to our home page to view an introduction to the various courses that Ride-Tek MTA provides – Motorcycle Training.